From coast-to-coast B20 is now formally supported by nearly all vehicle manufacturers. Today more than 78 percent of the diesel vehicles coming off production lines are approved for use with B20, as noted during the annual Biodiesel Showcase that took place yesterday during the 13th Annual National Biodiesel Conference. Some big examples of support include General Motors (GM), Hino and PACCAR along with Ford and Fiat Chrysler. Among U.S. heavy-duty truck segments, which account for more than 87 percent of actual diesel fuel usage, every major engine manufacturer supports B20 in their new engines except for Daimler’s Detroit Diesel, which remains at B5. Many users are realizing that B20 biodiesel blends offer them a cost-effective and seamless option to help meet increasingly aggressive greenhouse gas and carbon reduction goals. Energy continues to warrant focus on the worldwide stage as a primary way to reduce the effects of climate change and during this week’s conference, biodiesel role in this efforts were highlighted. 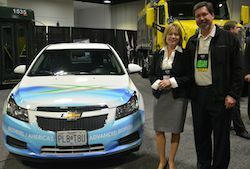 The Biodiesel Showcase was one of the best visuals of the benefits of biodiesel and a demonstration that consumer choices for biodiesel play a strong role in influencing vehicle manufacturers to continue to increase their support of biodiesel. Following are three brief videos about vehicles that are approved for the use of B20. You can get the scoop on PACCAR’s “bright yellow truck” by clicking here.